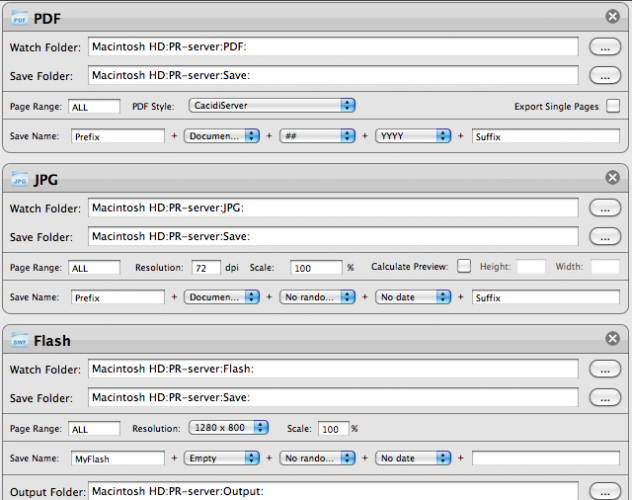 Cacidi Production Server is a Workflow server, using Adobe InDesign Server, to create queues of PDFs, eps, prints, ps files, flash and more based on Adobe standard InDesign files. It’s easy to set up watched folders for input and output, each folder can be assigned a certain Action, and an unlimited number of folders can be set up to allow for any combination of Actions and Workflows on the server. An Action is a single process that can be done to any InDesign document, usually in the form of exporting the document to a certain file type with predefined settings. There are a total of 8 Actions available that can be joined together in a queue to form a Workflow, with each Action specifying one step for either manipulating or proofing the InDesign document before the next Action occurs. The Cacidi Close and Process Plug-in for Adobe InDesign will list any Workflows made available on the Cacidi Production Server as defined by the Cacidi Workflow application. This list of Workflows are made available from the File Menu of Adobe InDesign, allowing a user to select a desired Workflow and quickly send an InDesign document on to the Cacidi Production Server to be processed as defined in the Workflow. This allows any person with Adobe InDesign to select a document and quickly and effordless create PDFs, Flash, Print jobs and even proof check the document in the process to maintain coorporate standards for document exports and prints. Cacidi Close And Process requires Adobe InDesign, and are at the moment free of charge, with all Cacidi Production Server licenses.